"It's better to give than to receive," as the saying goes; but this tower is a great argument for the opposite! It's the perfect way to send your greetings, say "Thank you", or show your appreciation! This white and red tower holds the most sumptuous treats one could ever desire. 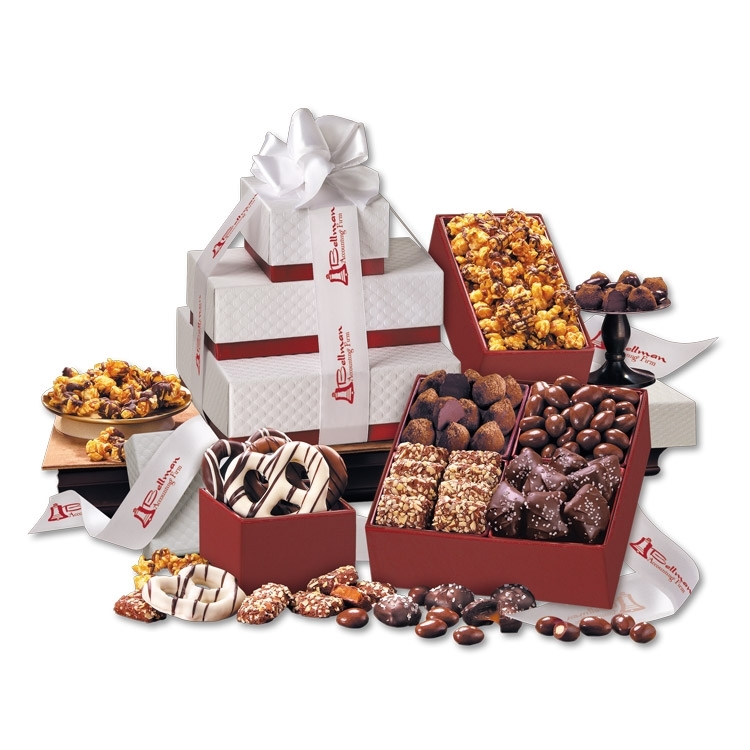 We start with our signature English Butter Toffee, Cocoa Dusted Truffles, Chocolate Covered Almonds, and Chocolate Sea Salt Caramels; then add Chocolate Sea Salt Caramel Corn and Jumbo Pretzels dipped in Chocolate – White, Milk, and Dark. A white ribbon foil-stamped with your logo ties it all together. Serves 9-14.